Baker's Cart // Enclume's original rolling work station is packed with many unique features. 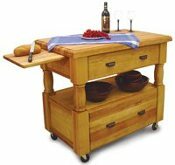 37"L x 25"D x 50"H Includes: Eastern maple butcher block top and shelf, two hammered steel grid shelves, heavy duty casters and 4 custom utensil hooks. 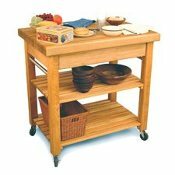 Baker's Cart Base // Baker's Cart Base (no top shelf) 37"L x 25"D x 36"H Includes: Eastern maple butcher block top, two hammered steel grid shelves, and heavy duty casters. Hat & Coat Rack // The simple beauty of Enclume's hammered steel shines through in this New England-inspired coat rack. 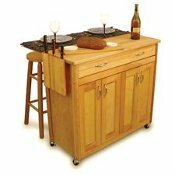 36"L x 4"D x 8"H Includes 4 double hooks Mounts on 32" Centers Assembly Instructions This kitchen island has just enough space for all of your everyday kitchen items and adds just a touch of grace to your kitchen. Rectangle Baker's Cart // A stylish variation of our Baker's Cart. The uprights curve out to form handles on both sides of the cart. 34"L x 24"W x 36" H Includes: Eastern maple butcher block top, two grid shelves and heavy duty casters. Assembly Instructions Rustic 4Peg Wall Hook Bar // Rustic iron wall hook bar features antiqued black finish and four peg hooks. Perfect as a coat rack! 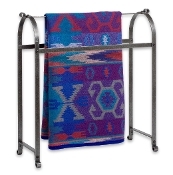 Size: 18.3" 6.8"
Shelf Coat Rack // Organize the busiest hallway with this five-hook clothing and accessory rack. 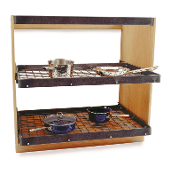 36"L x 7" D x 10"H Includes oak shelf and 5 hanging hooks. 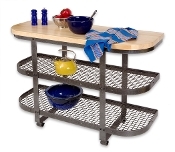 Mounts on 32" Centers Assembly Instructions This kitchen cart saves space, yet is designed to hold your microwave as well as other kitchen neccessities. This is a conveniently sized super island, for the mid-sized kitchen. Kitchen island with 2.5" cutting block top. 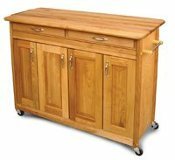 A longer kitchen island that will fit just about any kitchen. This kitchen island has our largest work surface, plus works well on the move. The mini version of our Empire Island serves the same purpose as the larger island, just on a smaller scale. Bakers Rack with Wine Rack. Holds 5 Bottles of Wine. Available in 4 finishes - Graphite, Satin Copper, Satin Nickel, and Oiled Bronze. 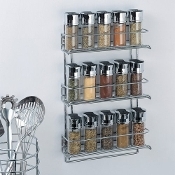 This versatile stand has six shelves to hold pots, pans, plants or anything else you need to keep organized yet accessible.